These Terms & Conditions (the “Terms”) govern your participation in the ‘Bethereum World Cup Contest’ (the “Contest”). By participating in the Contest, you agree to be bound by these Terms, so please read these Terms carefully. If you do not agree to be bound by these Terms, you should refrain from participating in the Contest. “Bethereum” means Bethereum Limited, a private limited company incorporated under the laws of Hong Kong, registered under CR No. : 2613099, with registered office at 31/F, Chinachem Century Tower, 178 Gloucester Road Wanchai, Hong Kong;. In order to participate in the Contest, you must be at the age of consent to form a binding agreement in your country (or older). Entry to the Contest is free and does not require making any purchase or paying any fee. You acknowledge that receipt of any benefit resulting from your participation and performance in the Contest depends on various factors, such as data gathering, processing and transfer, which may be within or out of our control. You expressly acknowledge and agree without any reservation that we are not liable, nor shall we become liable at any time in the future, for any event which may cause or result in the corruption of data, their incorrect collection or processing, their alteration or loss in transfer, or other malfunctions, and the consequences of such events, irrespective of whether such event is caused by us or a third party. You further expressly acknowledge and agree without any reservation that your participation and performance in the Contest does not establish for you any legal claim or right to payment or provision of any benefit, and that any payment or other benefit received by you in connection with your participation and performance in the Contest is entirely voluntary on the part of Bethereum Limited. You further expressly acknowledge and agree that participation or performance in the Contest does not convey the express or implied guarantee or promise on part of Bethereum Limited of any payment or provision of any benefit, irrespective of your conduct, performance or its result. 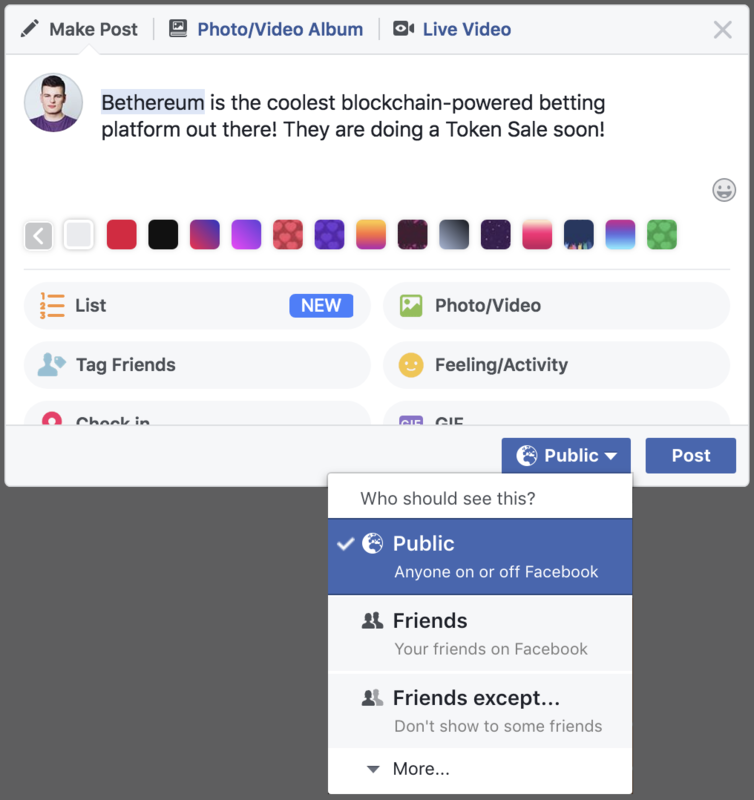 By your participation in the Contest you further expressly acknowledge and agree that Bethereum Limited reserves the right and is entitled anytime, without prior notice, to change the terms or terminate the Contest in part or wholly, without any compensation to you for its termination, change and their consequences. You further expressly acknowledge and agree that your participation or performance in the Contest does not create for you any rights in contract, implied contract, tort or on any other grounds. You further expressly acknowledge and agree that the integral part of your participation in the Contest is our data policy, under which (I) we store cookies on your computer, (II)) the cookies are valid for 31 days after your login so that you do not need to log in with every call, (III) after the lapse of 31 days, the cookies will expire, which will require you to log in again, (IV) the cookies will stay on your computer until you delete them, (V) for the purposes of monitoring of your interactions with our site, the cookies may be accessed, used and evaluated by third parties. Consent with processing of personal data. The User expressly gives consent to the Company to collect and process his personal data (the “Consent”) for the purposes of informing the User on specific directives, initiatives, or marketing activities, as well as offering and provisioning the services of the Company including mainly, but not limited to, those following from the Terms and any subsequent agreements or arrangements, entered into between the User and the Company, as the case may be (the “Services”). Usage of personal data. The Company shall process the personal data in connection with the Services or relevant communication to the User, including but not limited to, direct marketing communication to the User. 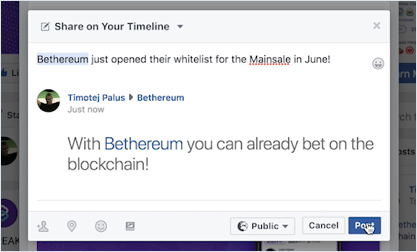 Provision of the personal data for the purposes of their processing, described in this consent, is the contractual requirement of the Company justified by the effort to efficiently offer and provide the Services of the Company and to enable the efficient performance and functioning of the Bethereum Platform and all connected parts. By accepting this Consent, the User expressly acknowledges and agrees that his personal data processed by the Company may be transferred to the third parties which directly or indirectly participate in the offering or provision of the Services. Such transfers of the User’s personal data may occur within the scope necessary or useful for offering or providing the Services. The Company pledges to the User that such transfers to third parties shall not authorise any such third party to use the User’s personal information for marketing communication. If the personal data is transferred under this paragraph, the Company shall ensure that when processing or otherwise disposing with the transferred personal data, the level of their protection in accordance with applicable laws and regulation shall be continuously observed. Duration of Consent. The Company shall process and maintain the User’s personal data for whichever contingency occurs earlier, between (a) the period until the provision of the Services ends, extended by the maximum duration allowed by relevant laws and regulations following the end of the provision of the Services, or by the period necessary for settling all the rights and obligations arising from the provision of the Services, whichever occurs later or (b) until the User withdraws his consent with the processing of the provided personal data. Withdrawal of Consent. The User acknowledges his right to withdraw his consent with processing of his personal data at any time, whereas such withdrawal will not affect the lawfulness of processing of the personal data, based on this consent prior to its withdrawal. The user further acknowledges that in case of withdrawal of the Consent, the Company shall be obliged to erase all his personal data, within a reasonable amount of time from receipt of the Consent withdrawal. The users acknowledges that in case of Consent withdrawal, he is aware of and accepts all direct or indirect consequences, which are or may be caused by such withdrawal. Amendment of personal data. The user acknowledges his right to request from the Company correction of inaccurate personal data or to supplement the incomplete personal data processed about the User by the Company. The Company endeavors to implement such corrections or amendments within a reasonable amount of time. Data Protection. Without prejudice to the mandatory provisions of the applicable laws, the Company shall endeavor to protect the User’s data from any unauthorised internal or external manipulation and acquisition. Mandatory disclosures. Each of the Users and other Persons acknowledge and agree that should the Company become subject to any order, ruling or other decision of a court or administrative body of any jurisdiction, requesting disclosure of certain data or information, such disclosures made by the Company shall be considered lawful and shall not constitute breach of any of the Terms. Notwithstanding the above, prior to any such disclosure, the Company shall make a reasonable review of the legal basis of the request and shall strive to restrict the disclosures only to what is lawfully required. For these purposes, the Company shall strive to apply any means of protection of the data and information, which are reasonable and legally viable. Restricted Persons. No Person shall attempt to access, use or register with the Platform or the Website, if he is subject to any Restriction. Right to assume compliance of the User and third Person. Given the variety and number of the Users and other Persons, including the potential Users and the Users accessing or attempting to access or use the Platform or any of its functionalities, all Users and other Persons acknowledge and agree that the Company is entitled to conclude that any User or a Person accessing, using and registering with the Platform is allowed to do so and none of his actions violate any Restriction. Therefore, the Company shall not be held responsible or liable on any grounds for any breach, tort, crime or any other offence, or loss of any type, incurred as a result of a breach by any User or other Person of any Restriction applicable to him. Continued obligation of Users and other Persons to ensure compliance. A Person attempting to access, use or register with the Platform is obliged, prior to such act, to ensure that he is not subject to any Restriction and that he is allowed to do so by all applicable laws and regulations. In case of any doubt in this regard, such Person undertakes to seek and receive independent professional legal advice. Any User learning of such limitation that arose after his registration, or learning of a risk that such limitation may be or become applicable to him, undertakes to seek independent professional legal advice on this issue to make sure he complies with all limitations based on the laws, regulations and Restrictions applicable to him, and if he learns of any such limitation, he undertakes to cease using the Platform or any of the Platform functionality which would violate any such limitation. If the Restriction so requires, the User is obliged to inform the Company of such event. The Users and other Persons expressly acknowledge and agree that the loss resulting from such limitations does not constitute the right of the User or other Person to seek any damage or compensation whatsoever from the Company or any Person or third-party associated with the Company. Taxation. The User acknowledges that any prize or reward received as a result of the User’s participation in the Contest may be or may later become subject to taxes or similar mandatory payments to the government claiming jurisdiction over the User or over the proceeds of his transactions. The User undertakes to ensure that he duly and timely complies with all of his tax or tax-related obligations. Should the Company be required by any administrative body or government authority to make any payment on behalf or because of the User in this regard, the User shall promptly, on the Company’s first request, make the Company whole and harmless for the amount of any such payment and for the associated costs incurred by the Company in this regard. It is also User’s sole responsibility to withhold, collect, report and remit the correct taxes to the appropriate tax authorities. The Company is not responsible and shall not be held responsible for withholding, collecting, reporting, or remitting any tax arising from the User’s participation in the Contest. Prize distribution. Prizes awarded as a result of the Contest shall be distributed by the Company to the prize winners in a reasonable timeframe after the end of the Contest. The Company reserves the right to distribute any prize at a timeframe suitable to the Company, to individual prize winners as a whole sum or split into multiple amounts over any suitable period of time. Additional restrictions of the User’s access to and use of the Platform. At sole discretion of the Company, the Company may cancel or limit the access of the User to the Platform. Such limitations may regard certain periods of daytime, or the total daily time, for a limited or permanent duration, set by the Company at the Company’s discretion. In addition, the Company may impose on the Users other limitations or restrictions of the User’s access to the Platform. Wherever possible, the Company shall undertake its best endeavor to inform the User by e-mail or through the Platform about the implemented cancellation, restriction, reasons, and duration.